…like an offering to the gods. It lies on its back, head to the east, feet pointed west. It is the corpse of a man in executive suit, coat buttoned, hands crossed on chest, sightless eyes staring into the blue New Mexico sky. Except for the neat little bullet hole low in the center of the forehead, Bernalillo County sheriff’s detective Luis Flores can imagine the victim is taking a quick nap between meetings, that the man is about to stretch, yawn and tuck back a light blue French-cuffed sleeve to glance at the gold Rolex that glitters there. But this is no longer a man, not a thing that walks and talks and breathes. This is mere meat, gristle and bone, the empty remnants of something that was once alive, the primary evidence in a most puzzling crime of murder. Flores stands about 20 feet away watching the crime scene team at work. A forensic photographer is circling the body, taking advantage of the West-sinking sun to capture everything with stills and videos. His flashgun winks again and again to bring out details of each image. Flores steps closer to examine the corpse. It’s carefully arranged, “displayed” as the experts at the FBI call it, a sure sign that a psychopath has been at work here and is sending a message. The legs are straight, shoes aligned side-by-side and clean, almost as if the killer has run over them with a polishing cloth. The back is straight, shoulders squared, nothing out of place. The tie is knotted in a proper Windsor, not too tight, just right. 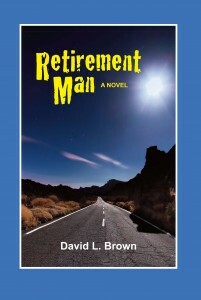 As a manuscript this book was submitted in the 2012 annual international writing competition sponsored by SouthWest Writers. 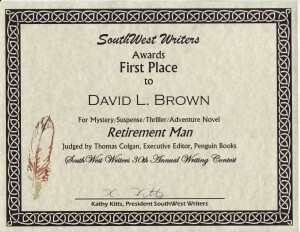 It won first place in the Mystery /Suspense/Thriller/Adventure novel category, judged by Thomas Colgan, the executive editor of Penguin Books.